Working with the University of Maryland’s Center for Environmental Sciences, Sigma developed a new, and now patented centrifugal separator and ultraviolet disinfection system. The separator removes invasive aquatic species from ships’ ballast water, therefore preventing the introduction of destructive organisms into US waters. The system was developed and manufactured in NJ and installed aboard the M/V CAPE MAY at South Locust Point Marine Terminal in Baltimore, MD. Sigma continues to be actively involved in ballast water research and testing of separator systems and has become one of the country’s foremost experts on ballast water. 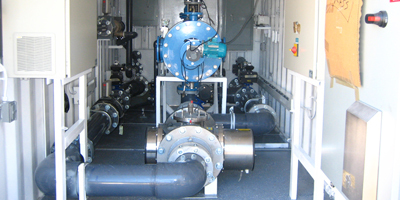 Sigma Design manufactures specialty water treatment systems to solve tough separation challenges. Product Development Services, Concepts, FEA Analysis, CFD Flow Simulation, Fabrication Design, Electronics Design, PLC Programming, Pilot & Test.